Two advanced civilizations, the Paranoids (a race of alien humanoids) and the Solenoids (who are all women) are waging a war that has gone on for centuries. When the Solenoid fleet leaves a battle to defend an experimentally terraformed world from the Paranoids, one damaged Solenoid ship, the Star Leaf, is separated from the fleet. Only seven women remain alive on the ship: Eluza, the captain, Rabby, the solid more or less main character, Lufy, the brash pilot, Catty, the mysterious science officer, Pony, the pink-haired ditzy tech, Patty, a solid crew member, and Remy, the cute one. After narrowly escaping the battle, the crew of the Star Leaf decides to continue with their orders and rendezvous at planet Chaos to defend it. It turns out, however, that their ship is the subject of a Paranoid experiment. In the end, it is up to the remaining crew Star Leaf to defend the artificial paradise of Chaos from the Paranoid fleet and the plans of the Solenoid leaders. Gall Force is an excellent space story, which deals with many interesting topics in as deep way as it can in 90 minutes. This is Girls in space, who only seem capable of advancing the story after they have had a shower. The movie is a mish-mash of various science fiction movies, and manages to pull it off with only a few negative aspects. The characters are heavily stereotype and are all willing to die for the cause - something which the viewer doesn't find out about until the end, and even them all the characters deaths become a bit pointless. However this movie spawned many sequels which take the story through many centuries and it does begin to make sense. This is an epic story split into lots of mini average adventures. The animation is old school anime, and has aged fairly well, and on the whole this is classic anime. It has a good story, which leaves you wanting more and manages to set the scene up for continuing adventures. However the biggest surprise is its interesting take on the whole Adam and Eve theory, oh and what happened to our moon. 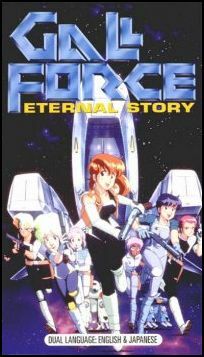 Gall Force - Eternal Story is a good film, and has been transferred to DVD well. You get some pretty poor extra's buy standards today, but when the film is this much fun you can live with it.